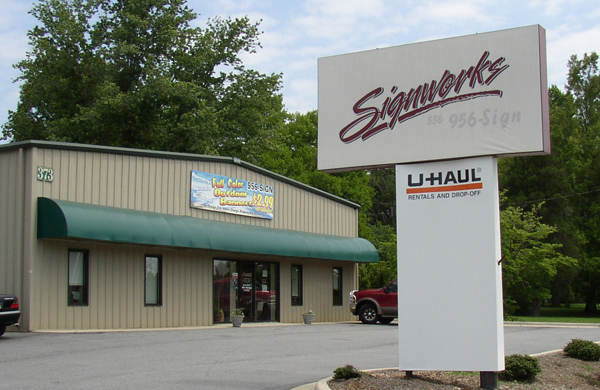 Signworks of NC, Inc. has served the triad for 20 years in the sign business. We have been family owned and operated from the beginning. We pride ourselves on listening to our customer ideas and turning them into a functional, attractive design that will get attention. By creating a sign that the public recognizes and remembers, we create the ability to get more traffic in to your store. After all, that's why you get a sign. Signs are the first impression your business has to the public, so make sure your sign is doing what it should. We are here to help you with the sign buying process. Here is a run down of how it works here at Signworks: First, you will fill out the "Request for quote" form. Within 48 hours, we will review what you have asked for and produce a quote. (At this point we may call and ask you some questions about where you are using the sign and insure the substrate you requested will suit your needs.) After you have given us the go ahead from the quoted price, we will design and send you a Proof. Again this is typically within 48 hours. This proof is a digital mock-up of your sign for you to review and request changes if necessary. If no changes are required, submit it as approved and we will get to work on your sign. All orders, large and small, go through this VISUAL INSURANCE PROCEDURE. This process assures YOU that the signs being produced are what you expect to get. We want this to be a pleasant experience for you and your company, in the end we are sure you will be pleased with the result. Take a look at our product gallery to see some of what we have done and come up with some ideas for your own sign. If you have a logo that you need to send to us, please use the SEND A FILE link on the left. If you have PMS colors that we need to match, put them in the additional information section of the send a file section. Enjoy your visit to our site and feel free to contact us with thoughts, questions or suggestions.